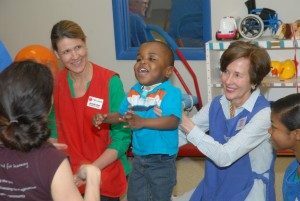 As a privately funded early intervention program, The Bell Center is always grateful to have the support of our community, volunteers, donors and friends. There are many ways you can help us as we help infants and toddlers who are at risk for developmental delay. If you and a group are looking for fun and unique ways to help, please contact Kelly or (205)879-3417. We want to ensure you are recognized for your generosity! Because we are a 501(c) 3 organization, all contributions to The Bell Center are tax deductible. We welcome your contributions which will enable us to continue to provide important early intervention services to the children we serve. You may securely make a one-time donation or set up a recurring donation on this website.